The Whites make Dragon’s Tooth and Lehigh Gap look like the Shenendoahs. Yesterday I finished the White Mountain section of the Appalachian Trail with a 21 mile slack pack. It was one of my most difficult days on trail. It took 13 hours with the last 5 in the dark during a thunderstorm. I survived the Whites! Wildcat Mountain. August 28, 2016. It has been a long, tiring journey through one of the most difficult sections of the AT. I had one of the most terrifying nights of my life. I saw the glorious, breathtaking views. Tomorrow I’ll cross into Maine and will begin a bittersweet final 300 miles. One of my closest friends joined me on the trail for two days. 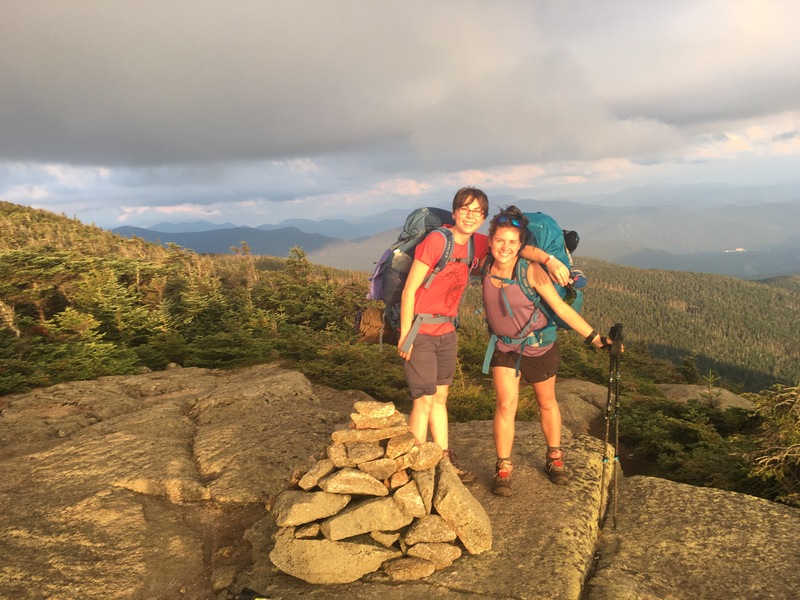 She did fifteen miles in the White Mountains for her first time backpacking–and she rocked it. I felt a little bad for putting her through a tough section but I knew she could do it. We had a friend who had hiked the trail in 2010 who has since passed away. I knew it was important to her for her to do some of the same trail he had done. Rebecca received the trail name “Cotton” for sporting a cotton t-shirt during her trek. Though she only joined me for two days, her visit reminded me of why I started this journey in the first place. She hiked this section with fresh eyes and a great attitude. Cotton would stop dead in the middle of the trail to gawk at a large boulder. I wouldn’t understand at first and then I would remember when I would be mesmerized by something like that in the beginning. I realized I had stopped noticing things the way she did. During the first couple of miles Cotton stopped and said, “Look!” I thought it was a moose or something scary, but she had noticed a leaf that was just starting to change colors in the middle of the trail. “It’s a leaf,” I said. “It’s a beautiful leaf,” she replied. She was right. I had become immune to the beauty that I was constantly surrounded by. I am so thankful for her visit and for reminding me to stop and look around. The Whites are phenomenal. I am loving the views and the challenge this gorgeous section is offering. However, I miss big miles, which is impossible in the Whites. It is frustrating not making your goal everyday because you’re averaging less than one mile per hour during some sections. My friend Rebecca told me that sometimes instead of getting frustrated with your obstacles, it’s better to change your beliefs. I’ve been trying to change my thought process and realize that it’s not about speed and that it’s fine to slow down and enjoy the journey. You know how they say that the weather can change in an instant in the Whites? Well, fortunately, I’m here to tell you that it’s true. We started the day with beautiful weather and the reports said it was to stay clear and sunny with a little wind throughout the day. We started at the summit of Mt. Lafayette and by the time we got to the top it was windy and chilly, but still clear. I had, stupidly, decided to forward most of my winter gear past the Whites. This was the dumbest thing I have done thus far on this hike. Luckily, fellow thru hiker, Rumblejunk, let me borrow his thermal underwear. Layered up and warm, we decided to summit and hike over Franconia Ridge. 80 mile per hour winds are all fun and games. But when the winds turn to 120 mph, it’s downright frightening. There were several of us going over the ridge when the winds were 70-80 mph. A couple opted to go down to a hut 1 mile off trail. Rumblejunk, Wolverine, Flash, and I decided we would push on to the next campsite. Wrong decision. It was 30 degrees with wind chill and I had no gloves. We decided to book it to tree line. As soon as we went back into the wind we were blown on the ground. We tried crawling on all fours. We could barely hold onto rocks without being blown away. The four of us ran back behind the boulder and did the only thing we could do. We set up Flash and Wolverine’s 2 person tent. It took all four is to haphazardly set up the tent. We crammed inside and began one of the most uncomfortable nights any of us would ever have. The wind only got worse. The tent gradually blew down the mountain over night. We dozed for an hour at best. Every couple of hours we would wake up to make sure we were all alright. We had all shown signs of hypothermia. Around 5:15 am, Wolverine woke us up and told us we should make a break for it. So we did. I emerged from the tent to find a sunrise that took my breath away. I felt so lucky to be alive. Sunrise. August 23, 2016. Mt. Lafayette, NH.